When a patient comes to the Emergency Department with a compromised airway, every second counts. The longer a patient's brain is deprived of oxygen, the harder it is to treat that patient and ensure a full recovery. “Our goal is to minimize any damage a patient might experience from loss of oxygen," said Dr. Shira Brown, Site Chief of Emergency Medicine for South Niagara, who chaired an initiative to improve our difficult airway processes. For the many scientific leaders around the world who treat these complicated injuries, they are always on the lookout for the kinds of advances that can help save lives. Education, technology, training – these are the tools for saving lives. The Difficult Airway Society's Annual Scientific Assembly is where these experts gather every year, sharing information in the name of patient care. It is a prestigious international event, where real solutions are presented to critical problems. One of the solutions presented at this year's assembly in Edinburgh, Scotland was made right here in Niagara. “Right People, Right Equipment, Right Timing: No Failed Airway." This is the guiding principle behind Niagara Health's Difficult Airway Pathway (DAP). In trauma cases, doctors, nurses, and respiratory therapists are often faced with complicated injuries that make it difficult to open the airway and send badly-needed oxygenated blood to the patient's brain. Someone in a serious car accident, for example, could have injuries around their head, neck and chest that make it harder to intubate and oxygenate them. Niagara Health's Difficult Airway Program was created to solve one specific, yet complicated problem: treating those difficult airway patients in the fastest, safest way possible. How did they do it? They created a comprehensive process, based on the Difficult Airway Society's guidelines, featuring education and training for the staff that work in the ED, intensive care unit (ICU), and urgent care centre (UCC). Then they assembled equipment and carts with all the tools needed to manage these complex cases. But the most important part – the part that made their peers take notice the world over – was that they standardized the education, the procedures and the equipment across all of Niagara Health's EDs, ICUs and UCCs. “No matter what Niagara Health site we are at, we all know the cart, equipment, and approach to difficult airway is exactly the same and everyone is on the same course of action plan," said John Chirico, Niagara Health's Lead Respiratory Therapist. “Niagara Health's development of its difficult airway program is what makes the organization unique from all others." The patients are the ones who benefit most. “I have seen first-hand patients having positive outcomes since implementation of the program because we had to intervene using the pathway and equipment," Chirico said. Last November, members of Niagara Health's DAP team shared this new pathway with the world. Surrounded by international experts on treating difficult airways, Dr. Ridhabh Alfayadh, Chirico, Dr. Brown, Dr. Helen Caetano and Dr. Melanie Hollidge presented three posters. One was an overview of the project, one focused on the educational module created for the DAP, and one poster was a comprehensive case review about how the project made a difference in one specific case. “We used their guidelines, so to essentially go back there and report back to them on how we used their guidelines and implemented them was very reaffirming," said Dr. Caetano, the Ear Nose and Throat Lead at Niagara Health. “The feedback that we got was that this is exactly why we have our Society is to get the word out and to have a standardized approach." Innovation plays a vital role in improving healthcare delivery, patient satisfaction and patient outcomes. Whether it is technology, processes or education, innovation allows our healthcare providers to better diagnose, treat and care for their patients. By the same token, research is another big piece of the puzzle, fostering specialized knowledge, skills and expertise. 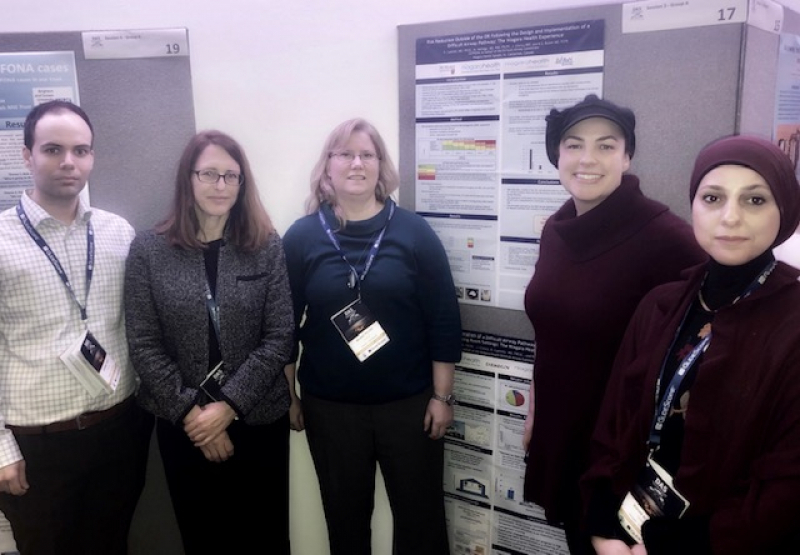 The DAP team also presented posters at Niagara Health Research Day, in November and they published an article in the March 2019 issue of Healthcare Management Forum. This made-in-Niagara solution is just one of the many ways patients in Niagara benefit from the culture of innovation and research at the heart of Niagara Health. The program is seeing results and those results mean better outcomes for Niagara Health patients. Photo: Members of the Difficult Airway Pathway team present their work at the Difficult Airway Society's Annual Scientific Assembly in Edinburgh, Scotland in November 2018.